Condition is Used as on the pictures - No box. Cut Out Size 171 mm x 180 mm. 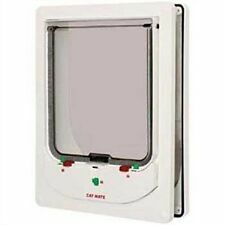 Wicklow - Staywell® Deluxe Infra-red Cat Flap - White. Once inside, the flap can no longer be pushed open as the Infra-red key is not present. Suitable for most materials and can utilise tunnel extensions to fit any depth of wall. PetSafe Staywell Infra Red 4 Way Locking Deluxe Cat Flap Door - White Product features --- Helps keep out unwanted cats --- Easily maintained and cleaned --- For cats up to 7 kg Rigid, transparent plastic flap --- High impact plastic frame --- Suitable for walls and doors up to 5 cm thick, Fits most standard windows --- Infrared key with 4-way lock: in only, out only, open and locked What's included --- PetSafe Staywell Infra Red 4 Way Locking Deluxe Cat Flap Door - White Description Now your cat can let himself in and other pets or wild critters can't get in. Only pets wearing the special infrared collar key can use the door.The 4-way lock offers the ultimate in flexibiliy. 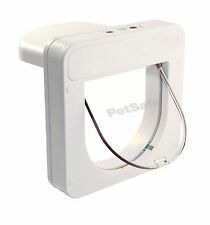 SureFlap Microchip Cat Flap with Mounting Adaptor & 2 RFID collar tags. 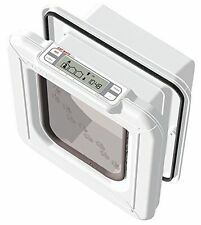 These fantastic microchip catflap can be fitter to glass, doors and walls. Works with all common identification microchips, I have also included two tags for non microchipped cats that are normally sold separately. Simple one button programming. Condition is New. Dispatched with Royal Mail 2nd Class. With Radio Frequency Identification technology, this PetSafe Microchip Cat Flap works without the need of a collar or accessory by reading your cats unique microchip ID. 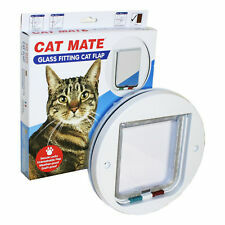 Total Depth of Cat Flap: 122mm. The Microchip Cat flap exclusively opens for your pet or pets, then locks once they are safely inside. 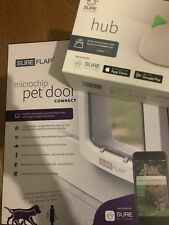 Using RFID (radio frequency identification) technology, the Microchip Cat Flap works by reading your pets' existing unique Microchip. Supplied one cat flap and 6 tunnels for walls up to 372mm thick. 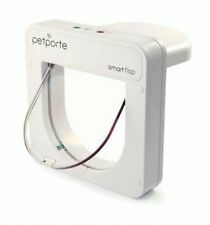 The PetSafe® Microchip Cat Flap works by reading your cat’s unique microchip ID without the need for a collar or accessory. can also use Petsafe R.F.I.D. collar keys (PAC19-20560). 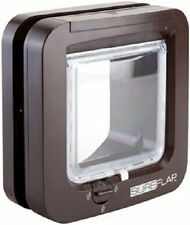 1 x PetPorte Smart Flap Cat Flap. If there's a problem, just let us know and we will fix it. 1 x Installation guide. EASY INSTALLATION Simple Installation; suitable for wood, PVC, glass or brick walls and doors.